Siblings having a "test" fight: a good lesson for these bears! Wild brown bear cubs, Finland. For some people, bears are these really cute animals. For some others, they are "dangerous" and should be avoided. One sure thing is that bears are magnificent animals and also an important species for their environment. Early morning - a small animal is running between the trees. After taking some pictures, this little one was looking straight at me. Maybe because of the excitement I moved too much and I produced some noise, or maybe the camera shutter sound was too loud. 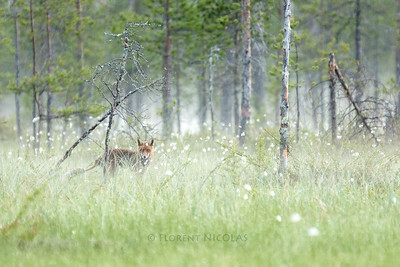 Small animal but still: a good encounter and a great feeling in the Finnish wilderness. The light is going down but life appears from the forest. A bear is taking its "nightly walk" along a lake to inspect the place. This scene happens almost every night here in Finland when bears are awake from hibernation, but showing it in a picture is an other story. Capturing these moments to share it with others is the best way to understand how magnificent and unique some places are. Safety is very important for bear cubs, specially when they are few months old like these little ones. Following their mum is essential to avoid the path of others bears. Playing time for this wild brown bear cub (and almost photobombed by a sibling...). It is a very important moment for a cub: this one will leave its mother in only few months and being safe will be one of the first rule to admit. 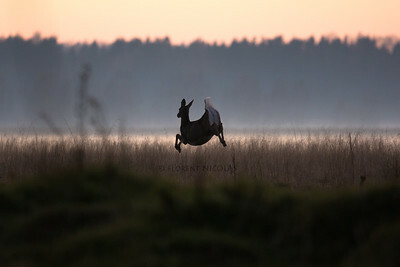 Breeding period for mooses, intense sounds are everywhere. Usually, I am not a big fan of close-up pictures, really not. But sometimes, you have to try, specially when a bear is looking at you! Wild brown bear siblings during a small "fight", just on the border between Finland and Russia. Cubs are spending lot of time to play together. These small fights are important for their future: they will have to share the taiga with other bears. Hidden moose in a dense untouched forest. It is always funny and interesting to watch cubs exploring their environment. You can never get enough of these little guys in good light conditions. Her calf was not far away, it was a chance to have a moment close to both of them. She never turned back or stopped having an eye contact on me: safety is the key to raise the young one. Curious wild brown bear, always smelling around to make sure that the next steps are safe. The light is going down but life appears from the forest. A bear is taking its "nightly walk" along a lake to inspect the place. This scene happens almost every night here in Finland when bears are awake from hibernation, but showing it in a picture is an other story. Capturing these moments to share it with others is the best way to understand how magnificent and unique some places are.